The ROBERTO POGGIALI was born from an alchemy of passion creativity and technical capacity and from the very beginning became an emblem of culture, poetry, creativity and manufacturing ability, typical of the Tuscan city. An exuberant company that carries the signature of its owner, who has transferred his passion to his collaborators and has communicated these values ​to a public who feel the same fascination. Attentive and sensitive to women's tastes, enchanted by the mysterious fascination of gold and silver, the master jeweller Roberto Poggiali, even today, is capable of loosing time notion, totally immersing in creativity, irresistibly and passionately attracted to metals and precious stones, whose intense and magic lights have enchanted men for centuries. The choice of materials and the care taken in workmanship are the main characteristics of the philosophy of ROBERTO POGGIALI, a young-antique company, that from the very beginning has made of "policy of small steps" its winning strategy preferring not to "conquer" the market with wild offers and adventurous strategies, instead slowly "convincing" without clamour, but with the concrete validity of their workmanship and excellent relationships with their clients. All creations are born thanks to a precious internal designer. Their principal characteristic, fundamental in making the ROBERTO POGGIALI a unique company, is in being totally hand made. In fact the ROBERTO POGGIALI still uses the techniques typical of the highest Florentine jewellery tradition. ROBERTO POGGIALI jewellery moves from the classic forms in Florentine style, to antique design and to the more versatile and contemporary lines in pearls and diamonds. One of the strong points of the Company is the choice of high quality materials used; for example the baroque pearls, each with its own form and shade of colour. In this way, even if the structures follow a similar style, each completed article is completely unique. 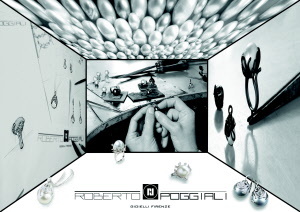 In this way the ROBERTO POGGIALI is able to offer his clients a unique product, this is also due to the fact that Roberto Poggialis' jewellery is distant from industrially produced types where every items is similar. The typically Tuscan workmanship makes Roberto Poggialis' jewellery exclusive. The collection we present on these pages is the SILVER & COLORS: a modern collection in silver, highlighted by diamonds and coloured enamel of the highest quality. Rigorously handmade and produced inside the own workshop. Strong, vivid colours, modern and various shapes are the principal characteristics of this original collection.